In 1941 Thelonious Monk and Kenny Clarke copyrighted "Epistrophy," one of the best-known compositions of the bebop era. The song's title refers to a literary device--the repetition of a word or phrase at the end of successive clauses--that is echoed in the construction of the melody. Written two decades later, Amiri Baraka's poem "Epistrophe" alludes slyly to Monk's tune. Whether it is composers finding formal inspiration in verse or a poet invoking the sound of music, hearing across media is the source of innovation in black art. Epistrophies explores this fertile interface through case studies in jazz literature--both writings informed by music and the surprisingly large body of writing by jazz musicians themselves. 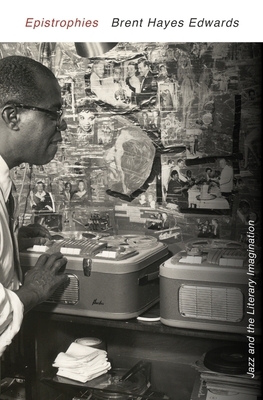 From James Weldon Johnson's vernacular transcriptions to Sun Ra's liner note poems, from Henry Threadgill's arresting song titles to Nathaniel Mackey's "Song of the Andoumboulou," there is an unending back-and-forth between music that hovers at the edge of language and writing that strives for the propulsive energy and melodic contours of music. At times this results in art that gravitates into multiple media. In Duke Ellington's "social significance" suites, or in the striking parallels between Louis Armstrong's inventiveness as a singer and trumpeter on the one hand and his idiosyncratic creativity as a letter writer and collagist on the other, one encounters an aesthetic that takes up both literature and music as components of a unique--and uniquely African American--sphere of art-making and performance.